We’ve all been through the shelves of offerings, trying out a lot of bath soaks, bubbles, and oils. Like you, I feel like I’ve tried it all. Not so. 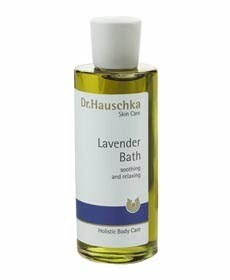 When there was a massive 40% off sale on Dr. Hauschka products at Whole Foods earlier this month I went a little bizerk and bought a slew of products I’ve never been tempted to splurge on before. But what I’m in love with most is this Lavender Bath oil. It’s smells amazing, not overwhelming. Leaves skin silky, not shiny. Like magic, it disperses in the water for a perfect concoction. And best of all, there’s no oil/dirt ring left when the water’s gone. Soak in luxury with this stuff! It’s heaven, and best of all, you’ll sleep better. I am. This entry was posted in Uncategorized and tagged beauty, nature, vacation on July 20, 2010 by pualana.